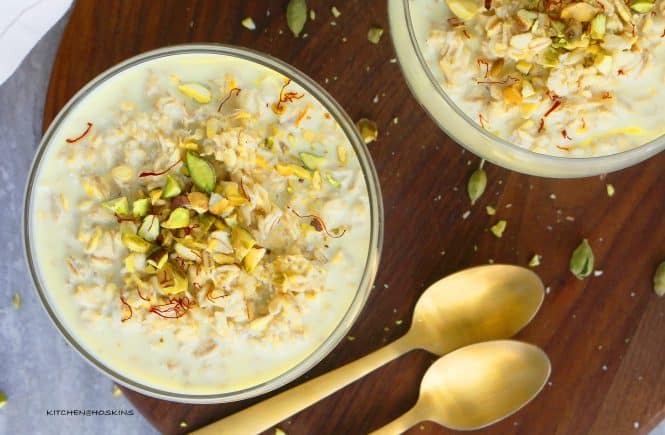 Overnight Oats that tastes like an Indian dessert! 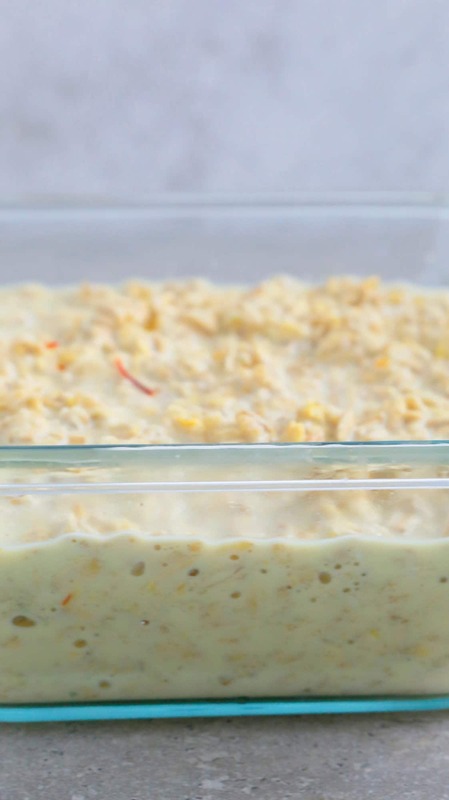 This overnight oats tastes like Indian kulfi ice cream!!!! Saffron, cardamom and pistachios take simple overnight oats into an exotic breakfast. 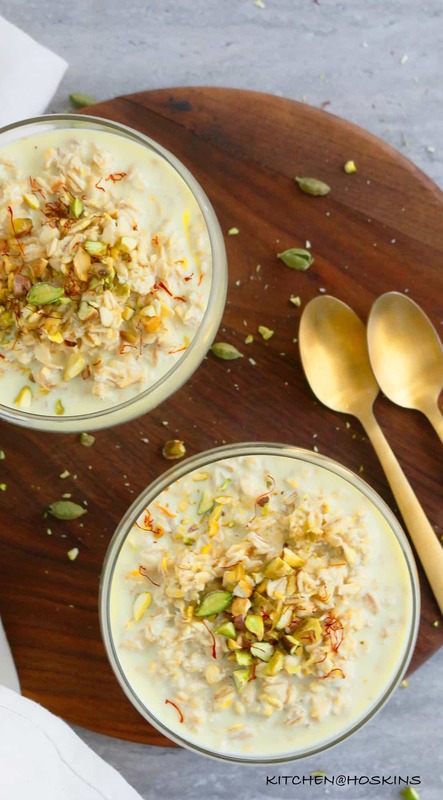 Kulfi overnight oats is easy and delicious. All the flavors. Cannot handle. Cold, creamy, no-cook, on-the-go breakfast. But, wait. It tastes like a cold, creamy Kulfi ice cream!!! Holy goodness. A tasty overnight oats! Oats : Well, overnight oats has to begin with oats! Old fashion oats is the go-to for a all overnight oats recipes. Steel cut variety is just too hard to be consumed just after soaking. They need to be cooked. Quick cooking / instant oats turns mushy with the long soaking process. Milk : You can use full fat or reduced fat. 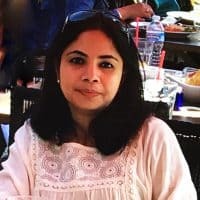 But, using other kind of milks like almond milk, coconut milk, rice milk, cashew milk, ….. will taste great but not give you the KNOCK YOU SOCKS OF KULFI FLAVOR. Sweetener : It is good old plain white sugar. Healthier alternatives like honey, maple syrup, coconut sugar, agave,….will not taste the same. Saffron : Ain’t kulfi without the bright saffron yellow. It is used for both color and flavor. Cardamom Powder : Freshly ground cardamom is highly preferred. But, it is not practically possible to grind 1/4 teaspoon cardamom powder. So, I usually grind a handful of green cardamoms in a dry grinder until finely ground. Transfer to a quart size zip lock bag, seal well and store in the freezer and use whenever required. Pistachios: Authentic Kulfi Recipes might or might not have nuts! But, if they do then it usually pistachios. Overnight oats are such a great breakfast option during summer. It is cold and meal prepped in your refrigerator. 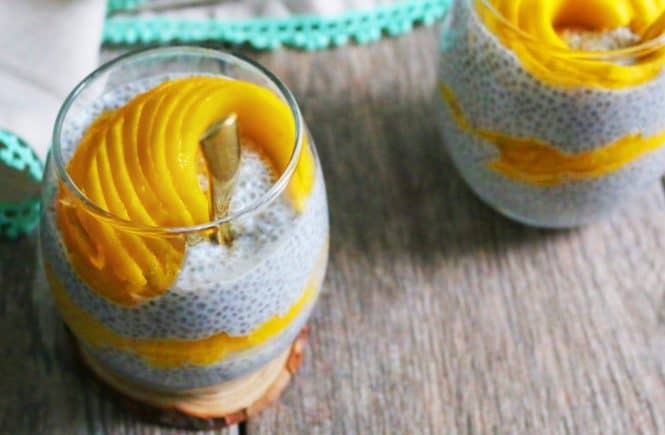 Kulfi is an Indian version of ice cream that is enjoyed all summer long and is perfect to beat the tropical heat (check out this Mango Kulfi ). 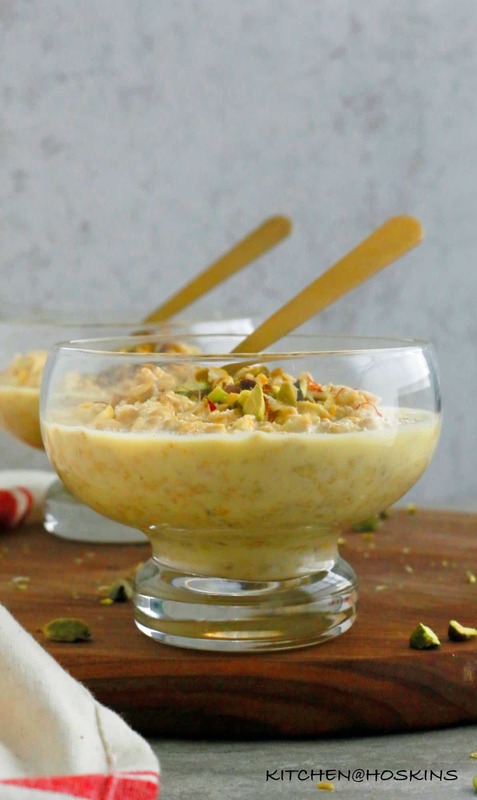 This kulfi overnight oats is an amazing mash up of both flavors!!! And, it totally works. 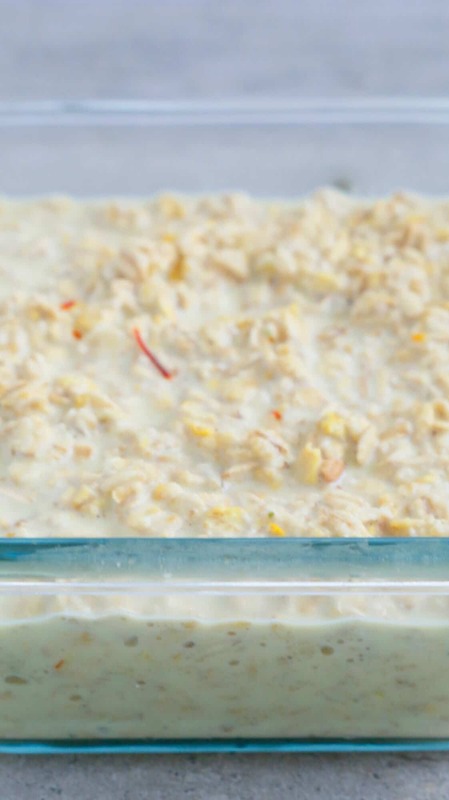 How to make Indian overnight oats? Step-1: Stir old fashion oats, milk, sugar, saffron (remember to crush with your finger tips to break them to into tinier pieces) and cardamom powder in a mason jar or any other container with a lid. Refrigerate overnight or up to 4 days. Step-2: Just before eating, stir in chopped raw pistachios and stir once to distribute the nuts and saffron, so the golden color is evenly distributed. Well, that is my favorite part of overnight oats. 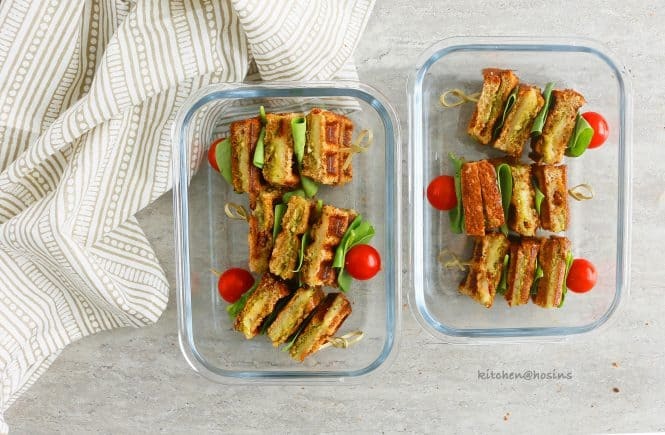 There is no cooking involved and it is perfect for busy / lazy mornings! Shrikhand Overnight Oats – Overnight oats that tastes like Shrikhand!!! Pumpkin Cheesecake Overnight Oats – Overnight oats that tastes like Pumpkin cheesecake!!!!!! Black Forest Cake Overnight Oats – A cool, refreshing breakfast on a hot day. Everyone’s favorite classic Black forest cake, but, healthier…much healthier in the form of over night oats. Banana Nut Muffin Overnight Oats – All the flavors of a banana nut muffin in your convenient overnight oats. Dairy free and vegan option. 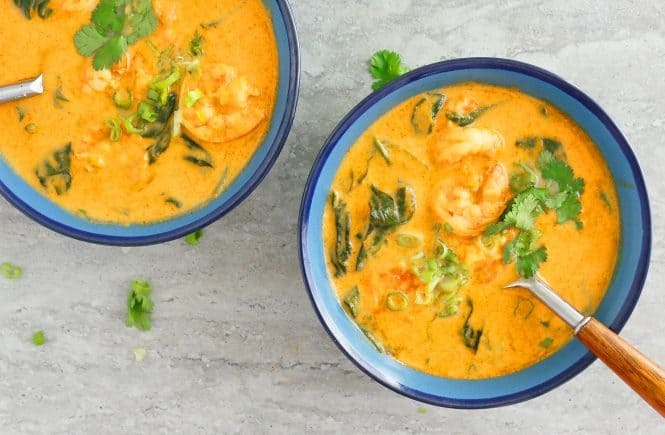 Curried Cashew Spinach Soup – This curried cashew spinach soup is light, creamy, spicy and tastes amazing!! Tandoori Roasted Chickpeas – Spicy roasted chickpeas that is tangy, crunchy and highly addictive. Chickpeas that tastes like tandoori chicken!!!!! Zucchini Medhu Pakoda – Authentic South Indian style pakodas but with a twist!! Tandoori Chicken Sandwich – Super delicious chicken sandwiches made with tandoori chicken and a lemon-herb mayonnaise. 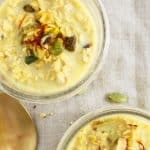 This overnight oats tastes like Indian kulfi ice cream!!!! 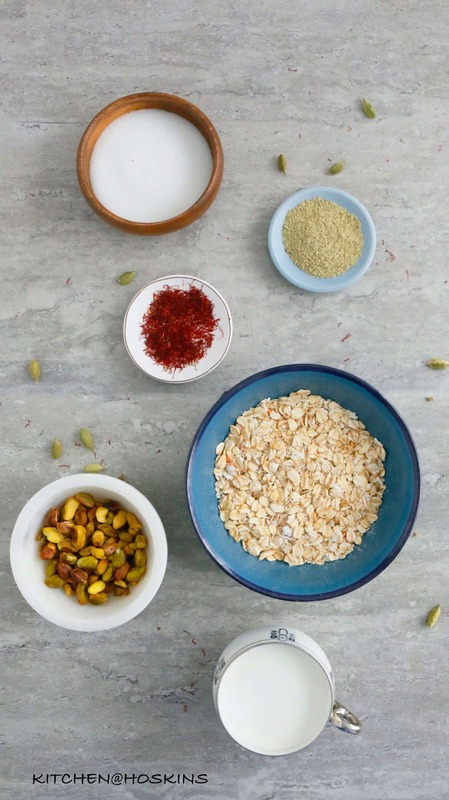 Saffron, cardamom and pistachios make simple overnight oats into an exotic breakfast. 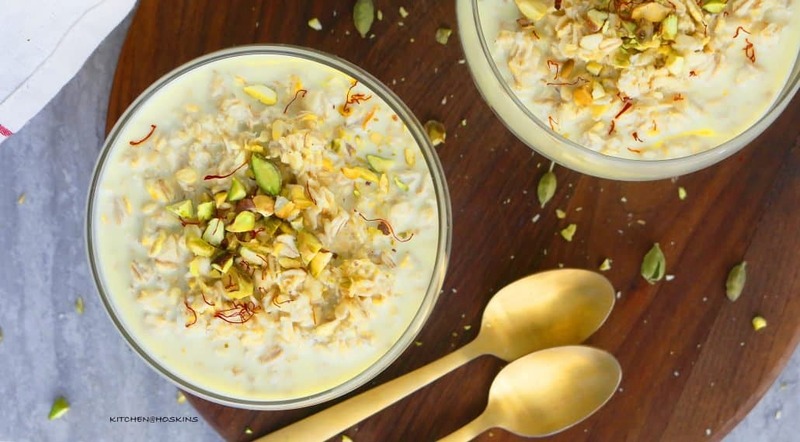 Kulfi overnight oats is easy and delicious. Combine all ingredients (except pistachios) in a mason jar or a container and stir well. Cover and place in the refrigerator overnight (at least 6 hours and up to 2 days). Uncover, add chopped pistachios and stir well to distribute the nuts and saffron. Cardamom powder - Freshly ground cardamom is highly preferred. But, it is not practically possible to grind 1/4 teaspoon cardamom powder. So, I usually grind a handful of green cardamoms in a dry grinder until finely ground. Transfer to a quart size zip lock bag, seal well and store in the freezer and use whenever required. All contents and images are my original work, unless and otherwise mentioned. Please do not use my recipes or images without linking back to www.kitchenathoskins.com. If you wish to republish a recipe, please rewrite in your own words and don’t forget to include a link back to the original recipe. I’ve never heard of this oats kulfi. The sound of the kulfi only makes your mouth watering. Thanks for the introduction of tasty and healthy for diet people ti have a diet kulfi. Haha I love the “what the what! ?” intro – so fun. This is such a cool overnight oats flavour Maria! !